I logged onto my blog today for the first time in what I thought was a couple days. Twelve. Turns out it was twelve days. It may be the longest I have ever gone without writing on my blog. Sorry about that. Today marks seven years since I have been home from Argentina. I feel like my life is divided into pre mission and post mission and the fact that the post mission side already has seven years on it absolutely terrifies. You mean I'm not 22 anymore? WHAT IS THIS HORRIBLENESS? Disclaimer #1: I am starting this post after midnight. I promised myself all day long I would do this post and then, in typical holiday fashion, I procrastinated. (Actually I started organizing the pen drawer. It is the black hole of my home and it was driving me absolutely insane.) And while I may break a lot of promises to other people, I never break a promise to myself, so here I am, right before bed, hammering out this post. Disclaimer #2: This post will be about my mission. If you think hearing about my adventures is Argy is a big yawn fest then quit reading, for crying out loud! No one is forcing you. I'll never even know if you stop right here. But I hope you don't. Stop reading that is. Because December 27 holds a special little place in my heart. I'm a date person. I remember all significant dates in my life. Baptismal date, date I started my period, first date with Greg, engagement date, date I went on a trip to California four years ago, date I bombed a calculus test, they are all stored away in my pretty little head. And TODAY'S DATE is very important. You see, it was exactly three years ago on this date that I was returning home from my old mishky in Argky. Join me on a trip down memory lane. The plane ride home was intense. Surreal. I don't think I have ever thought about anything as much as I thought about what the day would be like that I came home from my mission. 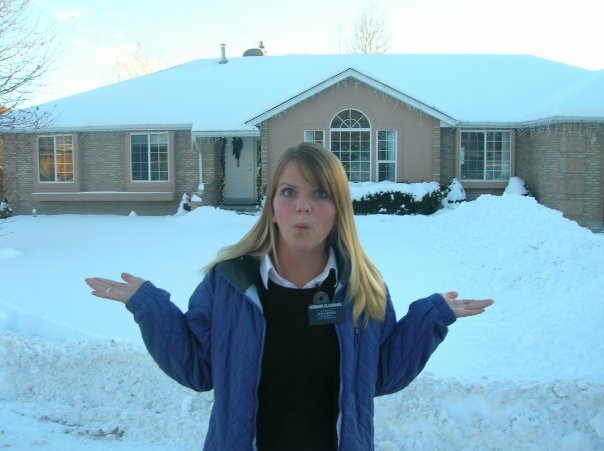 I was kind of homesick... alot... on my mission. I was sitting next to Elder Ward and Elder Daily and we talked about how totally crazy it was that the mission had actually ended. 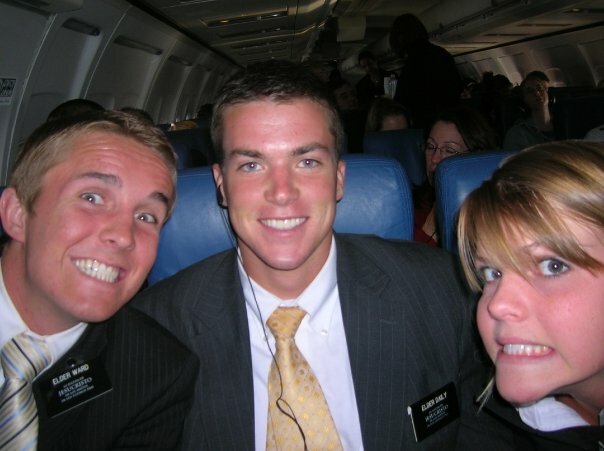 Elder Ward told me his sob story of the girlfriend who had dumped him on his mission and then married his best friend. I nodded sympathetically, happy that I still had my ever-loyal-and-faithful boyfriend at home. And by ever-loyal-and-faithful he had another girlfriend practically the whole time I was gone, so you know... that one didn't work out. I pictured the scene of my family waiting for me a million times. They'd be crying certainly. They'd tell me how long my hair had grown, how tan my skin was, how skinny my waist (not a good thing- those Argentine parasites got the best of me!). One of these days I will figure out that I should stop imagining the perfect scenarios because it never works out the way I think it will. The first thing that threw me for a loop was that my sister, Mindy, met me at the gate. She had landed in Salt Lake less than an hour earlier, so she had just come to my gate to find me. The second thing that threw me for a loop was that she was holding a baby. Her baby. I knew she had had a baby while I was gone, but it's just one of those things you don't fully register until you see it with your own eyes. Mindy walked with me to baggage claim. Her phone rang. "Hello? Hi mom. Yah, I'm with her. The plane just landed. Seriously? Okay... I'll tell her. See you in a few." She hung up the phone. "The fam is not here yet, mom had to make a few Christmas returns and your plane landed a few minutes early." So we went down the escalators, and I went to the bathroom while we waited for the rest of the family to show up. Don't feel bad for me. I understand. I'm the seventh child in my family. 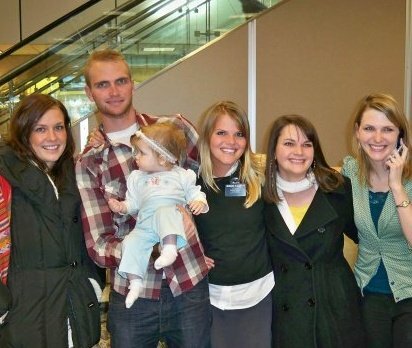 My family had already done the whole "Wait for your missionary at the bottom of the escalators" thing seven times. By the time it was my turn the whole process had really lost its charm. The whole fam damily arrived a few minutes later, carrying a darling sign my nephews had made and screaming "Welcome home, Bonnie! We missed you!" They told me I looked tan, they told me my hair was long, they told me my waist was small. My mom took one look at the mission clothes I was wearing and concluded "We must go shopping for you, dear!" They were forgiven. I wasn't hungry, but the fam insisted we stop to get a bite to eat. Something weird happened to my appetite in Argentina. And by weird I mean that it completely disappeared. We stopped at Cafe Rio and I could barely get five bites down. We drove home to Price, and dad made pizza and I didn't even eat a whole slice. Mostly I just remember walking around the house in a daze, not believing that I was actually home, everything seeming so foreign and so familiar at the same time. Everyone was watching a Jazz game and talking and laughing. I felt weird. So I went to bed. It was 7:30. I was in a new land. I felt as weird as I had felt when I first arrived in Argentina a year and a half ago. And oh, the snow. 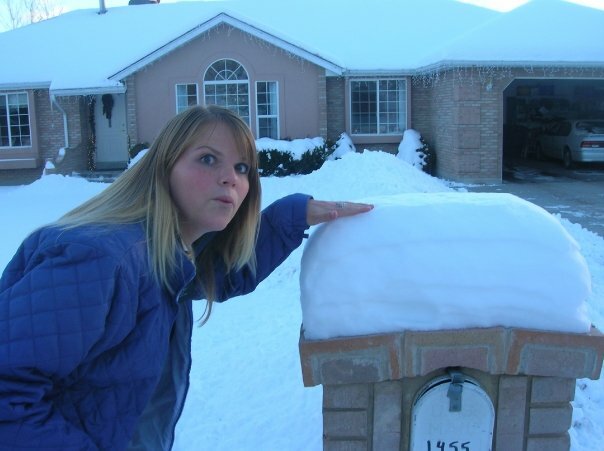 That year it dumped snow days before I came home. I went from sleeping on the roof and sweating through my shirts in minutes to a foot of powder and bundling up in four sweaters to keep warm. I felt so misplaced. Nobody told me that it was hard to come home from the mission. I didn't fit in anymore. Everything was too clean. Too nice. Too rich. While I was on the mission, the big 2008 recession had hit, but I didn't see no recession. I saw cars and tile and microwaves and carpet and girls with new clothes and this ain't no recession, people. This is prosperity. My big break down came a day later at the Burger King. Something about the ease of Burger King was too much for me to take in. Everything in that fast food restaurant screamed of wealth and luxury and ease. It was so simple to get a burger. So effortless. Two bucks and I had meat in my mouth, none of this slaving away over every scrap of food and living on dirt floors and washing clothes by hand. I couldn't handle leaving a third world country. Going from so little to so much completely did me in. So out of nowhere, I started dripping big fat tears into my half eaten Whopper. "What's wrong, Bonnie? What's going on?" My mom rushed to my aid, "We know it's hard, you'll have to adjust, you've been in a third world country for 18 months, but you'll be okay." My siblings added their two cents, "I remember it was hard for me too! I missed the mission, I felt like I didn't belong at home..." They hugged, they comforted, they wiped my tears and told me how much they loved me. It was sometime during that Burger King hug session that I realized that no matter how much I missed Argentina and no matter how hard it would be for me to adjust back to living a normal life, I did know one thing for certain. Excerpts of this post were originally published on December 28, 2011. I've been blogging for way too long.